From Sight to Vision: a review of Maurice Bowra’s book ‘The Romantic Imagination’ (reviewed by Dr. Gil Dekel). This book offers an important insight into the power of imagination by clearing a prevailing mistake about the English Romantics poets. The author shows that the poets were not indulged in imaginary states ‘removed’ from this world, rather they saw imagination as a tool to ‘open up’ perception to the spiritual that exists in this world (not in so-called ‘other’ worlds). The Romantics applied imagination as an effective tool as much as intellect is. All physical objects/events are imbued with unseen spiritual order, which is invisible to the intellect, yet is part of the physical world. Imagination (and not intellect) is the gate to the spirit world. Imagination operates with material, which is nature. Nature is a symbol of the spiritual. The beauty of nature exemplifies the beauty of the spirit. For imagination to work, one needs to look inside. No tradition or culture can affect the imagination; only an inner look brings imagination to work. To exemplify the act of inner look, the poet stands as an individual, observing inwardly. The role of the poet in society is to stand as case study. The intellect is a needed tool to communicate and allow one to be critical to the imagination, so not to loose oneself. The Romantics saw the imagination as an experience. Unlike Locke, the Romantics believed that the mind is the centre of the universe. The mind is the imagination. Imagination is the source of a spiritual energy, a divine force. Blake believed that the imagination is Eternity, it is after-life. Imagination is no counterpart to God; they both operate in the human soul. Thus, the creations of the imagination are divine. The Romantics: imagination concerns with a supernatural order. The English Romantics did not seek solitude. Poets tend to believe that their creations are concerned with reality. Not in analytical manner, still the poems penetrate life. Poetry deals with truth, which may ‘differ’ from the truth of science or philosophy, yet is still a truth. The Romantics argued that the imagination is a tool to see things that the intelligence is blind to. Coleridge had read Kant and Schelling. The German Romantics had a thrill of longing, but were not looking for the spiritual beyond this world. The English Romantics pursued the imagination as a way to get answers about the spirit. They wished to convey the mystery through the individual manifestation, thus to show it. Thus, they appealed to the complete self – the intellectual, the senses, the emotions. Only an individual manifestation of the imagination-experience encompasses the complete self. In the poet him/herself there is an example of that which cannot be expressed directly in words, but can be only suggested in words. The poet sought for an immense observation at life, which can be conceived through the singular experience in life. Through the single case we can apprehend something of the vision that the poets had. The spiritual laws differ from the general scientific laws, and need to be introduced through particular examples. Thus Blake rejected generalizations. The Romantic poems intended to present moments of visions rendered on single event. The Romantics were not absorbed in imagination, but saw it as a tool to convey and deliver the spirit into our world. They shade new light on nature. All the Romantic poets found initial inspiration in nature, and in nature they found moments when they passed from sight to vision. Blake explained that the imagination is a divine power and that all ‘real’ things come through it. Imagination operates with material, nature, which at the moment times is mere symbol of the spirit. At one point, nature will disappear and the spirit will be free to create without it. Until then, man has to take symbols from nature in order to interpret the unseen. Through visible things Blake reached the transcendental “eternity”. What Blake saw in visions was not an alternative world, but a spiritual order to which the physical sight can only be a metaphor. The spirit works in all living things. All mundane events have meanings. The seen world and the spirit world are bound. Keats saw the imagination as something revealed through creating – not existing in its own right, but as having a relation to ultimate reality. Wordsworth argued that inspired insight is itself rational. The great Romantics agreed that their task is to find through imagination the transcendental order that explains our world of appearances. They argued for the oneness of things, as the metaphysics claimed, yet they did not trust in logic but in insight. Not analytical reason, but a delighted soul, which transcends both the mind and the emotions. The Romantics were not self indulged, but thought that they could discover something through poetry; something which is denied of other people. Thus they devoted themselves. They were not content to have their own dreams and comforting illusions for themselves, but rather they wanted their creations to be real examples and embodiments of eternal that cannot be presented otherwise than in the individual instances. Blake did not write on reflection on memories of his childhood, rather he wrote as an observer, seeing the contrast between the child’s experiences and matured people’s experiences and concepts of reality. For Blake ‘fairies’ meant ‘creative imagination’. Blake used symbols as a tool to convey intellectually spiritual events. Blake believed that the use of allegory and symbols convey the inexpressible super natural world. Poetry itself is not a phenomenal world. The only means to speak of a phenomenal world it is by use of allegory. The lamb and the boy in Blake’s work are both God, protected by the shepherd or parent, which are also God. The fatherhood of God, to Blake, is equal in rights and privileges. Man lives in God, and God in man. God and imagination are one. Divinity is a creative power of the imagination, of God. Blake taught that man needs to experience life before reaching Heaven. Life experiences may be hard, but are needed. The childhood innocence is tested and proved feeble by events in life, which nullify the innocence. Life experiences break the free flow of imagination. Blake made many revisions to his poems, yet they were shaped by a creative impulse of inspiration. Blake believed that words were dictated to him. Words that come with a force, to which he felt himself in the presence of something larger than man. 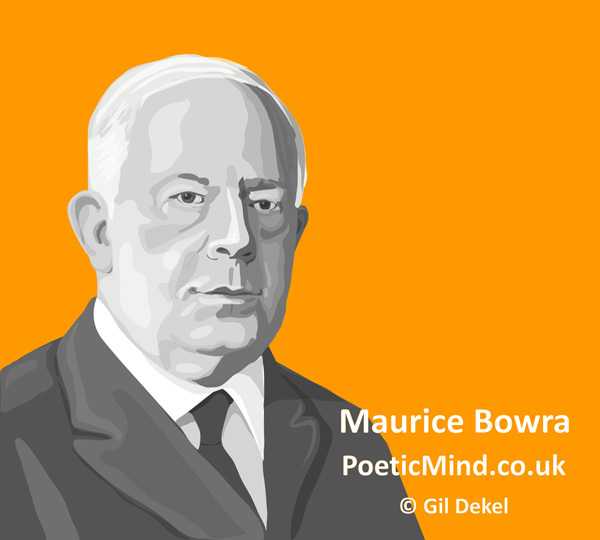 Maurice Bowra (image © Gil Dekel). Blake’s own spiritual experiences enabled him to describe such clear visions in his poems. It is wrong to connect Coleridge’s genius with his opium usage. He indeed took opium but not yet as a habit and only in intervals to get rest and sleep (1797-1798). The Romantic poets agreed that the creative imagination is connected with insight of an unseen order behind the visible things. Byron did not believe in transcendental order. Poe thought that imagination can be so concerned with the beyond that is has little to do with actual reality. Dante Gabriel Rossetti searched for other worlds through beauty and love. The English Romantics vision was unique. Other Romantics in Europe had longing feelings, but not visions. The Romantics insisted on the role of the imagination, yet imagination that relates to reality. Wordsworth and Keats loved the visible nature through which they could find themselves in the presence of what they called ‘eternity’. A man should search his individual visions. The Romantics did not rely on established traditions, but on inspiration. The Romantics relied on their own individual gifts. Maurice Bowra asks: could they exhaust their gifts and then have no tradition to rely upon? Maurice suggests that the Romantics are vague in describing the ‘beyond’. Sound is necessary in poetry as much as sight and meanings are. The Romantics sought for the intelligent thought, which is imaginative, not an abstract one. In their perception and observation, the Romantics could see visions of another world while looking at this world. They shed celestial light on objects of the sense and made them an example of the wonderful beyond. In a single moment they saw both the physical object and its eternal significance. They made interpretations of familiar scenes by some everlasting presence, which illuminates and explain it. This defines the English Romantics, and this was achieved through their trust in the imagination that works through the senses to convey something beyond the senses. The Romantics saw the individual and its idea. For example, the individual can be a bird, and its Idea would be the bird’s song that echoes through generations. The individual physical object or event has a symbol to its unseen timeless life. The transcendental is exemplified in Romantics poetry through the individual physical concrete. Associating the single sensible experience with the undefined superior order. The Romantics wished not to be passive observers, but active agents in this world, making people aware of the higher reality, which sustains the changing visible one. Dr. Dekel leads guided meditations and offers emotional counselling based on the imagination as seen by the Romantics. He completed his PhD research looking at processes of inspiration and creativity, drawing from the English Romantics philosophy and their practical ways of life. Dr. Dekel is also a graphic designer, poet and Reiki Master/Teacher. © Gil Dekel. 21 Dec 2010.